The Chalmar Beef farm and abattoir operation includes over 300 dedicated and passionate people, it has a farm feedlot capacity of 20 000 cattle and a further 19 000 cattle on pasture. The farm also produces maize silage on 1 000ha of high potential soil. Our farm is still owned by the Wethmar family who are involved in the daily operations. The grain feeding of the cattle at Chalmar Beef is an exact science which requires dedication and hard work. Our operation runs 24 hours a day, 365 days a year. It is our view that if you do not have control over the whole production chain the ability to produce consistent quality is severely compromised. We plant over 100ha of maize, soybeans and sorghum. Manure from the feedlot forms the backbone of our fertilisation program on our pastures and crop soils. Regular soil analysis is done to customise our fertilisation program. 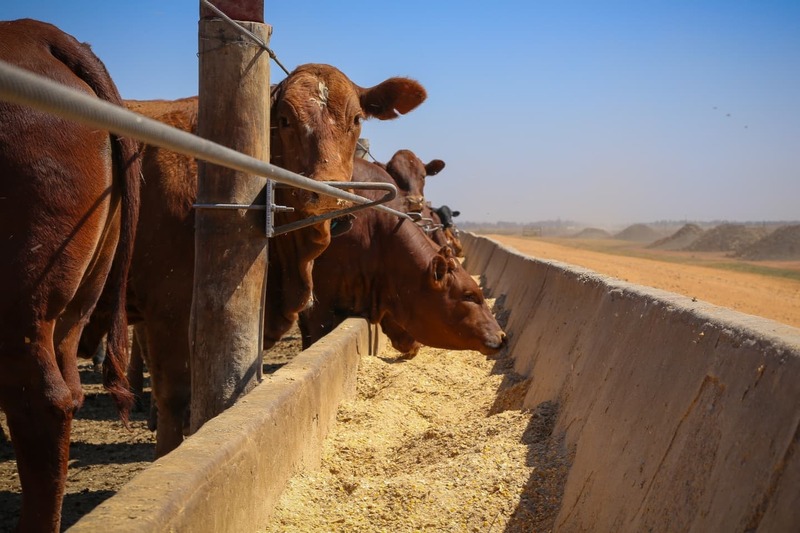 Our cattle are fed a balanced diet which is formulated by an expert feedlot nutritionist. The right amount of proteins, vitamins, minerals, fibre and energy are given to the cattle to ensure a healthy and strong immune system and maximise the animals growth potential. Our animals are walked over to the abattoir, which is far less stressful than transportation by trucks. Stress elimination for our animals is one of our main aims, which is essential to ensure a quality product. There is one constant which has not changed and will not change for Chalmar Beef and that is the focus on producing consistently tender and juicy beef. We don’t buy market ready cattle from other feedlot producers. We therefor have complete control over the production process from the feedlot into the abattoir. Chalmar Beef has the capacity to house 19 000 cattle on pasture. All young calves under 200kg’s go onto pasture and are pasture reared for 3 to 5 months before entering the feedlot. These calves receive supplemental feeding which contains the nutrients required to build a healthy and strong immune system. The supply of cattle to feedlots is very seasonal in South Africa. This leads to shortages of beef during certain times of the year. 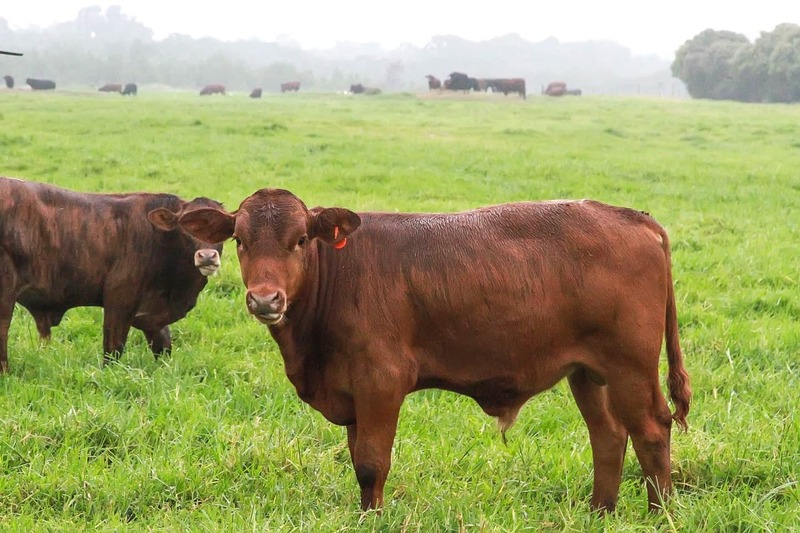 By rearing young cattle on pasture we ensure a consistent supply of cattle to the feedlot and ultimately beef on your plate throughout the year. All lamb produced by Chalmar is from lambs fed in our new dedicated lamb feedlot facilities. We do not buy in any market ready lambs and therefore maintain control over the entire feedlot and abattoir production phase to give our consumer peace of mind. We do this through various integrated processes that are part of our daily operations. We recycle the waste water from the abattoir. The waste water is processed through a purification system. This water is then used for crop irrigation. We monitor our borehole water quality bi-annually to ensure that there is no ground water contamination & the appropriate environmental impact studies are conducted prior to any new developments. Regular soil analysis ensures a customised fertilisation program for our soil. Manure from the feedlot forms the backbone of this program adding essential nutrients and organic matter to the soil. Chalmar Beef supports organisations in the community involved with the care of less fortunate people, special needs people as well as a local primary school. Chalmar Beef has a wonderful team of people who do the incredible work of producing great beef and lamb every day. Being a fully integrated company, we employ people from all walks of life and levels of skill. People have the opportunity to express their talents in diverse fields ranging from accounting to stockman ship to various highly skilled trades. Chalmar Beef has a philosophy of promoting people from within the ranks which necessitates the early identification of potential in people and providing them with the opportunity to excel through skills development & training.